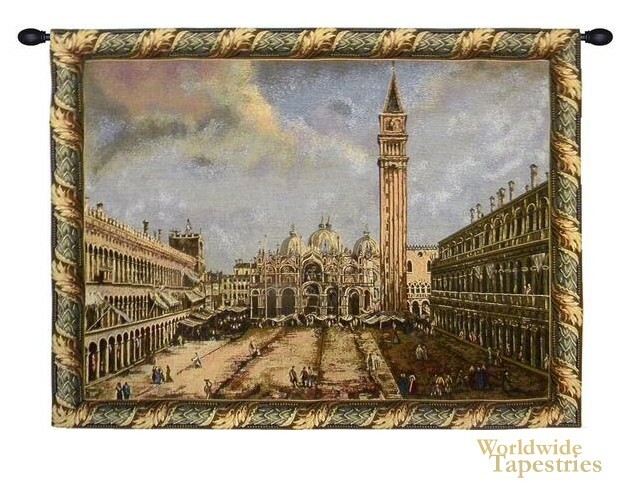 This Piazza San Marco I tapestry shows the famous Piazza San Marco or St Mark's Square of Venice based on the 1723-1724 painting by Canaletto. This artwork is by Giovanni Antonio Canal otherwise known as Canaletto is one of the Venetian old master painters. Here we see the glorious architecture of this region, where the public square has been a center of activity for centuries. We see St Marks Basilica in the center and the Campanile or bell tower to its right. The people are adorned with period clothing. The original is now in the Fogg Museum in Cambridge, Massachusetts. This Piazza San Marco tapestry is backed with a lining and a tunnel for easy hanging. Note: tapestry rods and tassels, where pictured, are not included in the price. Dimensions: W 38" x H 31"